Al-Azhar mosque in Egypt is one of the oldest and most important functional institutions in Egypt. Some Egyptian rulers have learned to use al-Azhar university to advance the nation through education. In other times, al-Azhar scholars themselves, have led the nation politically through the influence they have on people. And in other times, rulers have decided to use or disused al-Azhar as a means of controlling the population. In this article, a short history of al-Azhar university and its impact on the political life in Egypt is reviewed. Al-Azhar mosque in Egypt was built in 972AD along with a brand new city called Cairo. It was constructed by the Fatimid ruler, Jawhar Al-Siqilly (or Jawhar the Sicilian – Sicily was part of the Fatimid Caliphate until 1072). Fatimid dynasty, who were of the Shiite sect of Islam and originated from North Africa, ruled Egypt from 909 to 1171,. In the 10th century, they swept through North Africa and captured several islands in the Mediterranean Sea, including Sicily. Over time, however, the Fatimid grip over North Africa faltered as they split into competing tribes. In Egypt, however, the Fatimids prospered and their rule came with marked prosperity and progress for Egypt. Cultural and religious traditions introduced by the Fatimid are still practiced in Egypt to this day. Although the Fatimids were Shiite Muslims, the majority of the Muslim population in Egypt were Sunni Muslims. In order to educate the general public in the Shiite tradition of Islam, Jawhar Al-Siqilly ordered a grand educational center to be added to the al-Azhar mosque in 988. This became known as al-Azhar University. From the start, al-Azhar University was used as a political tool by an Egyptian ruler. It attracted clerics, philosophers and scientists from all corners of the Muslim world. In a matter of a few years, it became a beacon of learning and education in all sciences, secular and religious. In 1171, Saladin took over Egypt, effectively ending the Fatimid rule in Egypt and starting the Ayyubid period. He belonged to the Shafi school of Sunni Islam. According to the Shafi school, Friday prayer can only be held in one mosque throughout a city. Since al-Hakim Mosque was larger than al-Azhar mosque, it was preferred over al-Azhar mosque. This diminished the status of al-Azhar as a place of worship and learning during the Ayyubid period. Some say that this was done intentionally as to remove the Shiite influence and importance of the al-Azhar University teachings. In this case, Saladin disused al-Azhar for political purposes. Sultan Baybars I, the general who defeated the Mongol invaders, took over Egypt in 1260 and started the Mamluke period in Egypt. In 1266, he ordered Friday prayers be reinstated in the al-Azhar mosque. Between 1309 and 1516, several additions and expansions were made to the mosque. The most famous addition is the double-finial minaret that is the distinguishing architectural feature of the mosque. It was ordered by Sultan al-Ghuri and completed in 1516. In 1517, the Ottoman Empire took over Egypt and the mosque`s importance declined once again. This was done intentionally by the Ottoman sultans as to avoid having Cairo compete with Istanbul as being the most important city in the empire. By the 18th century, however, the Ottoman`s power began to sharply decline. This allowed the Mamlukes to regain some power in Egypt and the al-Azhar university began to be politically significant. The Ottomans began to take interest in al-Azhar university when it began to serve as a focal point of Egyptian protests against Ottoman rule in Egypt. This led to several clashes between Ottoman rulers in Egypt and public demonstrations organized by al-Azhar university. Al-Azhar`s political role rose to new significance, when Napoleon`s army invaded Alexandria and marched down to Cairo in 1798. It was al-Azhar that organized a mass revolt against French troops during that same year. Napoleon responded with a heavy hand and crushed the rebellion by force. Orders were issued to behead any Egyptian carrying a weapon in public. French troops intentionally desecrated the al-Azhar mosque in response for organizing a revolt against them. Two years later, the French General Jean Baptiste Kleber was assassinated by one of al-Azhar`s students. The al-Azhar mosque and university were subsequently shut down. A year later, in August 1801, Ottoman and British troops forced the French army out of Cairo and the al-Azhar mosque was reopened. If it wasn`t for the resistance organized by al-Azhar, Napoleon would have established himself in Cairo with no opposition from the local population. During Muhammad Ali`s reign (1805-1849), the educational operation of al-Azhar was greatly expanded. Secular education, such as math, science and history was added to the curriculum. Learning from Napoleon Bonaparte`s mistakes, Muhammad Ali sought to limit the political influence of al-Azhar by limiting the time the religious teachers spend with their students. This was accomplished by introducing a parallel program in which the students would be educated abroad. The formal reason for this was to expose students to secular sciences, which were considerably more advanced in the West. An ulterior motive was to loosen the teacher`s grip on the students minds. This process of manipulating and controlling the religious teachers of al-Azhar university by the rulers of Egypt became the hallmark of Muhammad Ali`s successors. Al-Azhar would go through periods of repression by the rulers of the time and through periods of relative independence where it would stand for the people`s rights. Most notably, the al-Azhar played an important role during the Urabi Revolt in 1882. One of the university`s pre-eminent scholars, Muhammad Abduh, would end up being exiled by the British (along with Urabi, the leader of the revolt) during that same year. Later, the British would also try to manipulate the al-Azhar placing scholars that either seemed politically neutral or supported the British. Despite the long history of al-Azhar`s political entanglements, it had benefited the Egyptian population by remaining a symbol and beacon of education and enlightenment. There are presently more than a 100,000 students of al-Azhar University (from North America to Indonesia) and its library contains more than 15,000 manuscripts and over 60,000 books. Although many secular faculties, such as medicine and engineering have been added throughout the ages, theology, philosophy and Arabic language remain the most active departments in the university. Today, al-Azhar university is considered to be the authority on Sunni Islam, presenting a moderate and tolerant interpretation of the religion. Dobrowolska, Agnieszka et al, Muhammad Ali Pasha and His Sabil, Cairo: American University in Cairo Press 2004. Williams, Caroline, Islamic Monuments in Cairo: The Practical Guide, Cairo: American University in Cairo Press 2002. Marson, Afaf, A History of Egypt, New York: Cambridge University Press, 1985. B. Dodge, Al-Azhar: A Millenium of Muslim Learning, Literary Licensing: Montana, USA, 2011. 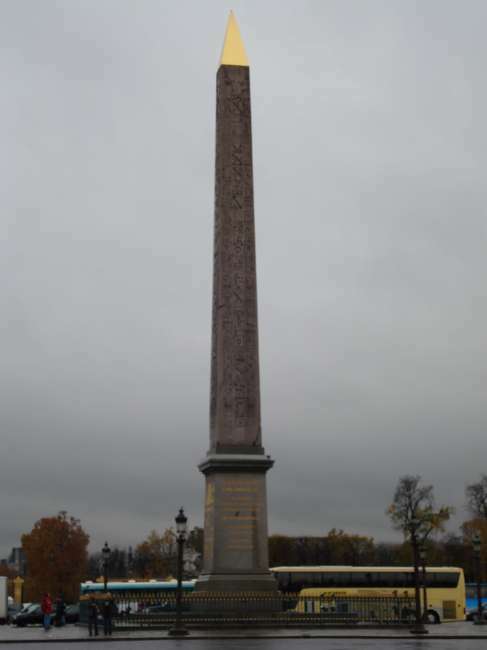 At the heart of Place de Concorde in Paris, France is an Egyptian obelisk with a golden top.